About eighteen months ago now a conversation took place on Facebook between a group of us disabled Christians bemoaning the lack of good quality Christian literature on the subject of the Church and disability, literature that was up to date with the Equality Act, with the latest thinking of disability scholars and that was culturally relevant to church in the UK, with so much of what was available coming from the US. After a series of these conversations we began to realise that we were morphing into a sort of team, spread across the whole of the north of England. So we picked Harrogate as a kind of centre point and in May 2014 we had our first meeting. It immediately became clear that writing a book on its own was not going to be enough; yes, we needed written material but we thought such material would be far better being delivered by disabled people themselves, people like us. We now have a core team of four people: three Anglican clergy and one disability professional, Katie, Bill, Laura and Dave. Katie, who has cerebral palsy, is a vicar in Dore. Bill and Laura are team vicars in Billingham: Bill has suffered with depression and anxiety and Laura with fibromyalgia and ME. Dave is an access auditor and he is blind, a guide-dog owner and diabetic. So since May last year the team have given advice to several churches,written several articles and a couple of guides, delivered talks and workshops and built up a big following on Twitter and Facebook. In an effort to become better known and to make ourselves more available to the C of E nationally, we have taken a leap of faith and booked ourselves a stand this July’s meeting of General Synod in York. We need to raise around £1000 pounds to purchase an exhibition stand and to meet printing costs to produce copies of the guides we have written. 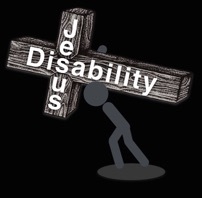 To that end we have set up both a Paypal and a Just Giving account both of which can be accessed via our website at www.disabilityandjesus.org.uk. Please take a look at our site to find out more about us and if you feel you’d like to donate please do.